Making headlines like her famous dad! Tiffany Trump has become more of a public figure since her dad, Donald Trump, decided to run for president. The 22-year-old recently cheered on her mom, Marla Maples, during season 22 of Dancing With the Stars, and delivered a speech at the Republican National Convention in Cleveland, Ohio, on Tuesday, July 19, after her dad officially became the GOP&apos;s presidential nominee. 1. She grew up in L.A.
Tiffany was born in NYC on October 13, 1993, but was raised by her mom on the West Coast since she was a child. Marla and Donald had a headline-making affair while the GOP presidential front-runner, now 69, was still married to his first wife, Ivana Trump. Marla, now 52, and Donald married in 1993 and divorced in 1999. Maples opened up about motherhood to Us Weekly in April. "The truth was, the challenge was being able to balance being a working mom and being there for a child full-time. Her daddy loves her, of course, but … I was the parent. I was the parent that was there in the flesh [and] with her all the time,” she said. "It was amazing. I wouldn&apos;t trade it for anything in the world. I learned the most and it brought me the greatest joy." Tiffany opened up about her relationship with the actress turned radio host during Oprah Winfrey&apos;s Where Are They Now? in 2011. She revealed that the two often cook together and are competitive when they play tennis. "My mom and I have always been very close," Tiffany, then 17, said at the time. "Everyone is always, like, &apos;You really have a good relationship.&apos; She&apos;s with me a lot of the time." Back in March, Tiffany showed just how much she cares when she attended a taping of her mom competing on DWTS. On April 11, Tiffany spoke to Us following Maples&apos; last performance. "I&apos;m so proud of my mom," she said. "And I&apos;m so sad that she was voted off! But I think every week she did better and better, and she was the perfect Little Mermaid this week, and last week I think she did an amazing dance to the song &apos;Happy!&apos; I think everyone tries their hardest and she truly was amazing." Tiffany revealed her passion for music during Winfrey&apos;s Where Are They Now? special. "I love music. It&apos;s always been very dear to me … It&apos;s more of a hobby right now, but we&apos;ll see in a couple of years if I actually do want to take it to the next level as a professional," she said in 2011. "I have a strong head on my shoulders … I&apos;ve always been grounded, people would think not because of who I am, but I&apos;ve always been raised with that sense of morals from my dad and my mother." Tiffany graduated from the University of Pennsylvania in May. Her parents, along with Ivanka Trump, stepmother Melania Trump and half brother Barron Trump, 10, were all in attendance. "Graduation! Congrats to the class of 2016! #upenn," Tiffany captioned a photo collage of her family on Sunday. She also shared a photo of sister Ivanka kissing her on the cheek. "Thanks to all of my family and friends who came to support me and Penn 2016!" She wants to make America great again! 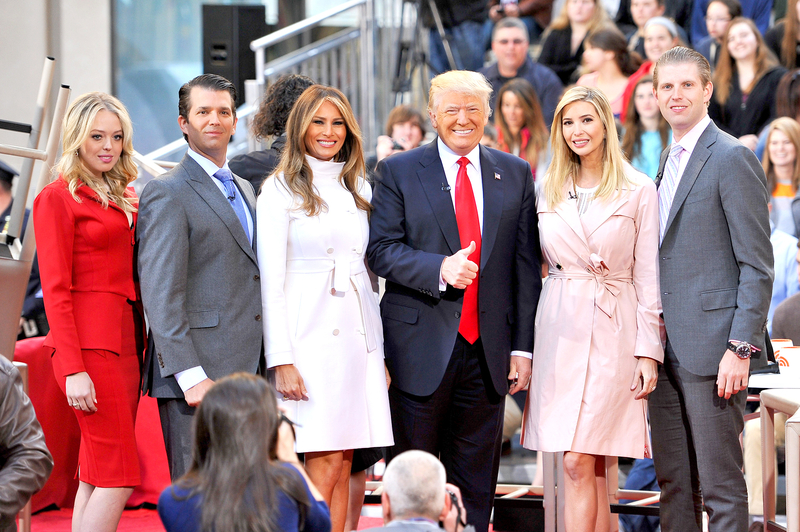 Tiffany joined Donald and his third wife, Melania, and her three siblings — Ivanka, 34, Donald Trump Jr., 38 and Eric Trump, 32 — during a Today show interview in April. "I think we truly need to look at all of the amazing things he&apos;s done," she said. "Luckily, he&apos;s continuing to excel. We&apos;re very proud." 6. She&apos;s happy to be a "Trump"
Tiffany opened up about her dad and famous last name during ABC&apos;s 20/20 in November 2015. "He&apos;s true to himself. And he speaks in a way that the average person can understand. I think that&apos;s refreshing for everyone," she said. "I&apos;m so happy to be Tiffany Trump, happy to be in the family I&apos;m in." Tiffany also gushed over her dad during Winfrey&apos;s Where Are They Now? segment. In one cute moment, she revealed that Donald came to her school in sixth grade. "I think that she’s got a lot of Marla," Donald said of Tiffany during a 1994 episode of Lifestyles of the Rich and Famous. "She’s a really beautiful baby." Tiffany had only kind words to say about Barron during Where Are They Now?, too. "He&apos;s the most amazing little boy ever, honestly. I love him so much," she said.
? ?❤️ Thanks to all of my family and friends who came to support me and Penn 2016! She also pointed out a photo of her and Ivanka at the business mogul&apos;s 2009 nuptials to Jared Kushner. "I was a bridesmaid," Tiffany told the cameras. "My brothers and sisters have achieved so much in their lives and have had so much success, but I&apos;m just 17, so I&apos;m still growing and learning," she added. "Since I have grown up on the West Coast, it definitely is different than all of them growing up on the East Coast. It&apos;s a different lifestyle, obviously, California vs. New York. New York — my dad is like the center of the city."